DMCI’s Chamber Choir is the newest choral addition to the growing music program at Daniel McIntyre Collegiate from Winnipeg, Manitoba. Daniel McIntyre is a Grade 9-12 school in Winnipeg’s historic West End, with a population of about 1,200 students. The music program boasts enrollment of over 250 students, with 100 members in the choral program. 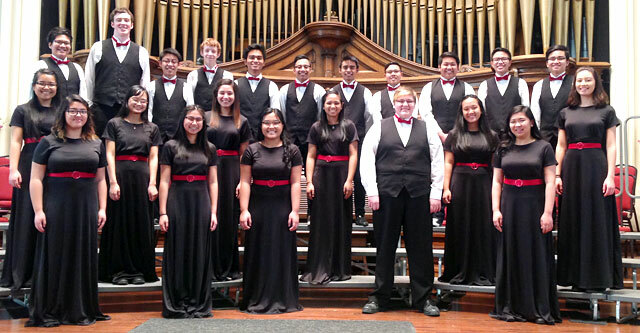 This choir is an auditioned group of 23 singers drawn from the ranks of the Daniel McIntyre Collegiate Concert Choir. Under the direction of Cynthia Peyson Wahl, this dedicated group of students meets once a week for two hours and sings a variety of styles from a breadth of time periods. They annually participate in Manitoba’s ChoralFest, and have been awarded invitations to MusicFest yearly, based on their participation there. The choir has been honoured with a several gold awards at the Winnipeg Music Festival and inclusion in the Choral Excellence and Gala Concerts. In 2011, they were honoured to receive the Earl Grey Trophy for best Choral performance of the Winnipeg Music Festival, and the Lieutenant Governor’s Trophy for best overall performance of the Winnipeg Music Festival. In 2013, the DMCI Chamber choir presented a Showcase Concert at the Canadian Rocky Mountain Festival, and were honoured to share the stage with their heroes, Kokopelli! This is their third appearance at the Canadian Rocky Mountain Festival, and they are thrilled to sing in beautiful Rolston Hall for you!